If all the QR codes does is take you to his website, which is also printed beside ths QR code, what’s the point of even having it there? Just displaying it without it having any useful purpose is not very useful. If all the QR codes does is take you to his website, which is also printed beside ths QR code, what’s the point of even having it there? Just displaying it without it having any useful purpose is not very useful, nor does it make you a tech trailblazer. Rather, it shows that you really don’t understand the purpose or utility of a QR code. Actually, the vast majority of ads that employ QR codes do the same thing: point you to a link that is also written somewhere else on the sign. The purpose is not to take you to some hidden content, but to save you the bother of entering a long URL on your mobile device. With a QR code, you just aim your phone camera at it, and it will pick up the encoded URL without any further input from you. It’s the same reason you’re starting to see QR codes in newspaper ads. If the purpose is to get people walking/running/biking past your ad to your website, then the QR code is where it’s at. Maybe all Liberals have them? 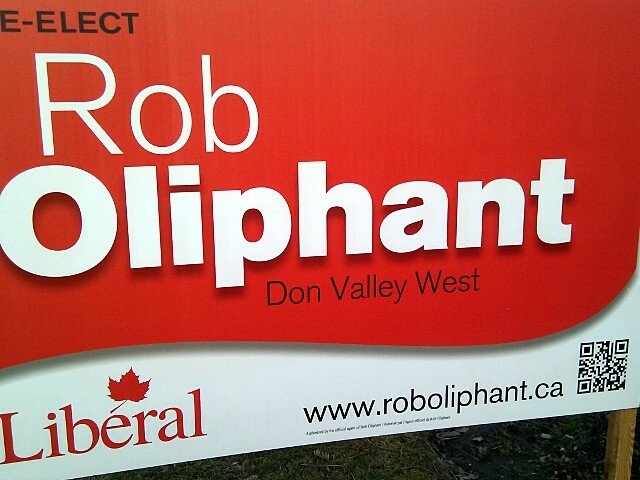 I know that the Liberal candidate in my riding, Toronto-Danforth, doesn’t have a QR code on his signs. I haven’t seen signs in any other ridings yet this week. The first I heard of a political candidate using QR codes was Larry DiIanni, candidate for mayor in last year’s municipal election in Hamilton. Fortunately, it didn’t help him much as Hamiltonians widely rejected this former mayor, and all around hired lobbyist, in the polls. The guy spent over five dollars for each vote that he got, which must be some kind of record. Several candidates for council seats also featured the codes on their signs later in the campaign. That’s hefty cost per vote, but Rob Ford and George Smitherman’s costs per vote were north of $4.50 and $7.50 respectively. Rocco Rossi’s five thousand votes cost him around $200 apiece, a figure that probably wouldn’t have improved much if he’d stayed until the end. I’m involved in online marketing for local businesses so I was amazed to see my local Conservative candidate using one on her signs. I got out of my car and gave it a scan. It’s tiny (had to get close)and it takes you to a ridiculously useless non-mobile optimized page with only her name on it. I felt like I had wasted my time. Check it out and let me know what you think.